Nothing special found. The only clue may be the open port of 80. To be honest, the box with less open ports is easier in general. 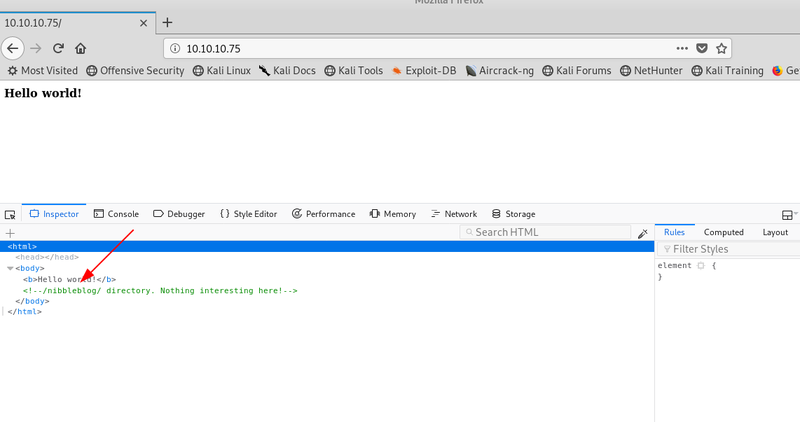 Access to http://10.10.10.75, just a web page of hello world. The version is 4.0.3. 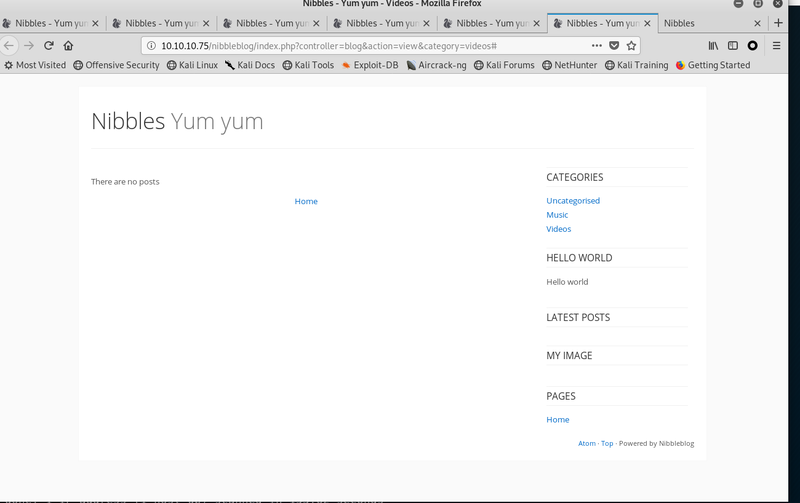 Google with nibbleblog 4.0.3 exploit. 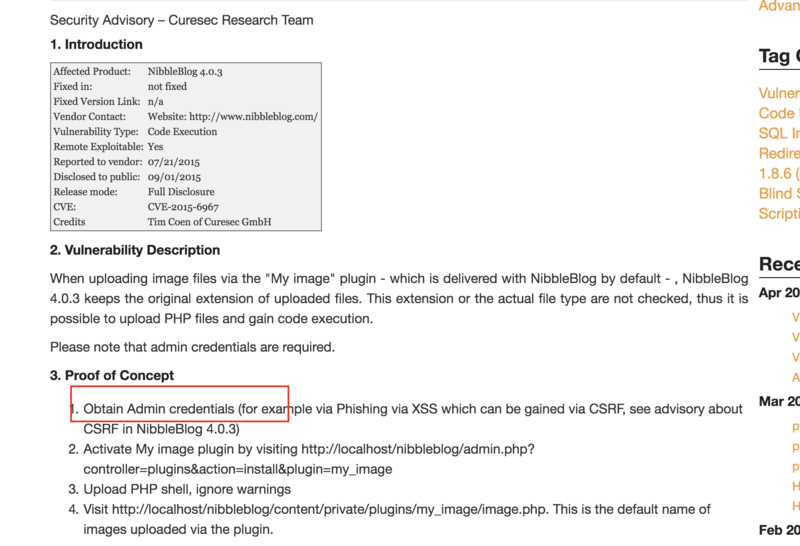 Find a report to talk about the exploit of nibbleblog of 4.0.3. The research report is detailed. But there is a precondition that you have to obtain admin credentials. 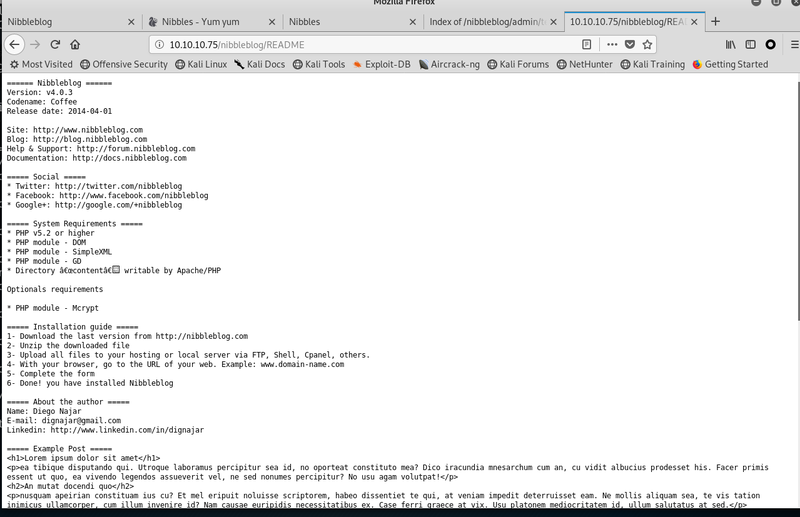 Access to login page: http://10.10.10.75/nibbleblog/admin.php. 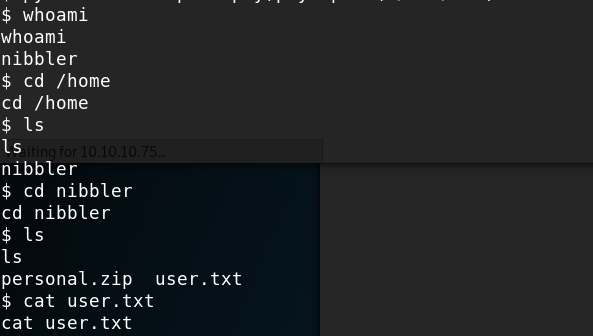 hydra -l admin -P /usr/share/wordlist/rockyou.txt -vV -f -t 2 10.10.10.75 http-post-form "/nibbleblog/admin.php:username=^USER^&password=^PASS^:login_error"
The hydra result shows that the password is 123456. But it is not correct. I doubt it has something with the blacklist of nibbleblog. Whatever, try to figure out the password. Try nibbles. Wow, we are in. You should try every password as more as possible. Visit http://localhost/10.10.16.44/content/private/plugins/my_image/image.php. This is the default name of images uploaded via the plugin. Accomplish the last step, get the user shell! The kernel seems quite fresh. It may be hard to find the kernel exploit. Try to check the sudo permission of nibbler: sudo -l.
The file seems to be a bash script with several tasks. There is no need to understand the usage of the file. 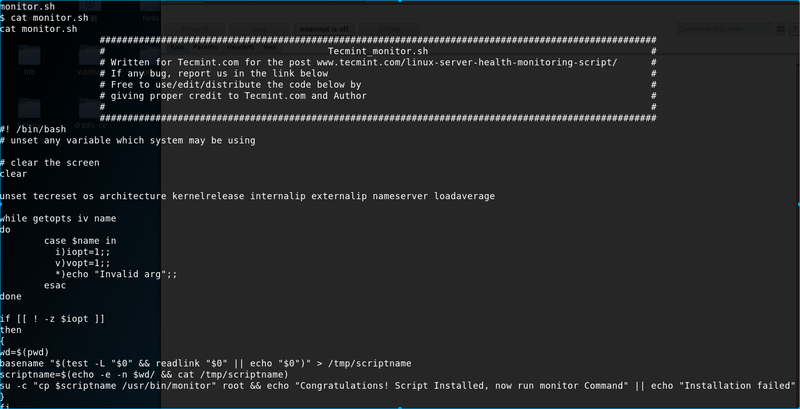 We can just modify the script to obtain root shell. So the script should be modified. As it is not convenient to modify the file in the victim machine directly. Nc can be used to send and receive file. You can change the send and receiver as needed. It is basic skills to transfer files between the victim machine and attack machine. 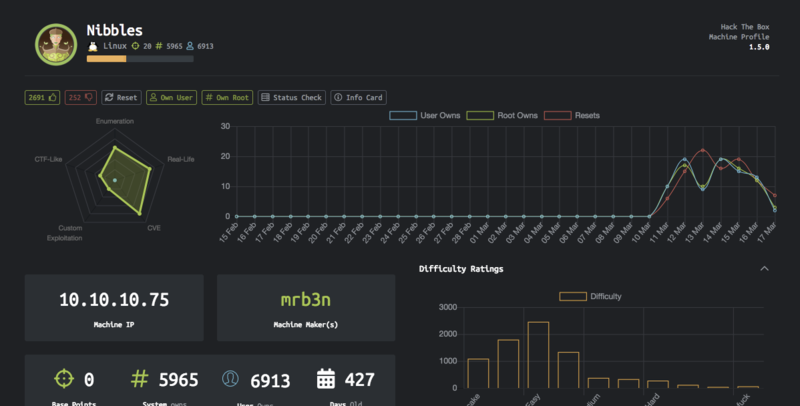 Nc is a good tool in linux. There’s a problem with the nc in the victim machine. e option is invalid in the victim machine. May there are some solutions, but I turn to other reverse shell methods right away. 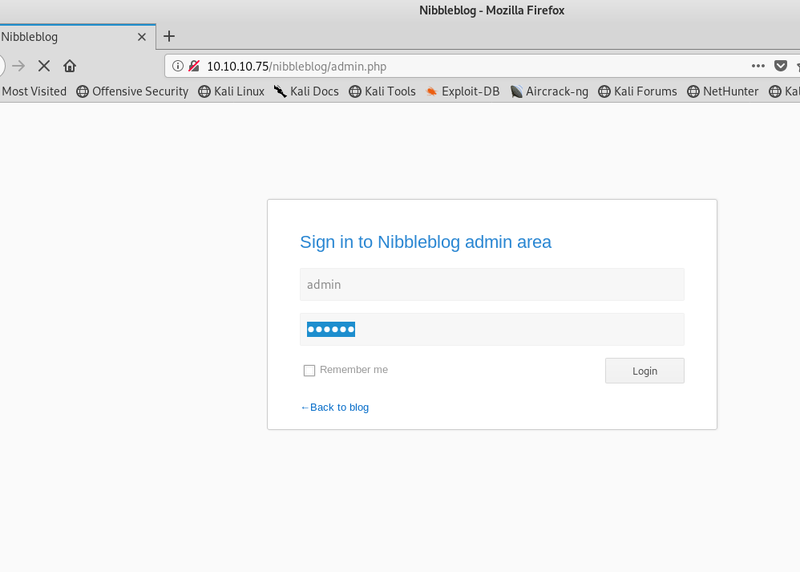 To be honest, the most difficult challenge of this box is to guess the password of admin of nibbleblog. The known vulnerability is not difficult to utilize. To obtain root shell, there are some methods to try. Some specific method cannot be utilized directly. You can try another method. Try harder!